I've developed an interest in all things Italian. And Prague certainly has plenty of Italian restaurants. I'd guess it is the second most popular cuisine after Czech. 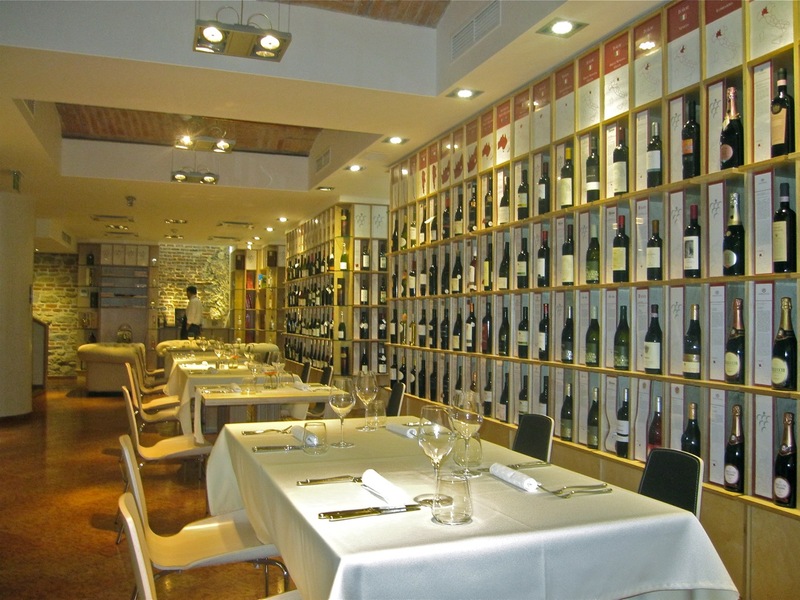 So I took my Italian friend to the relatively new Italian restaurant and wine shop, VINOdiVINO, to see how it measures up. 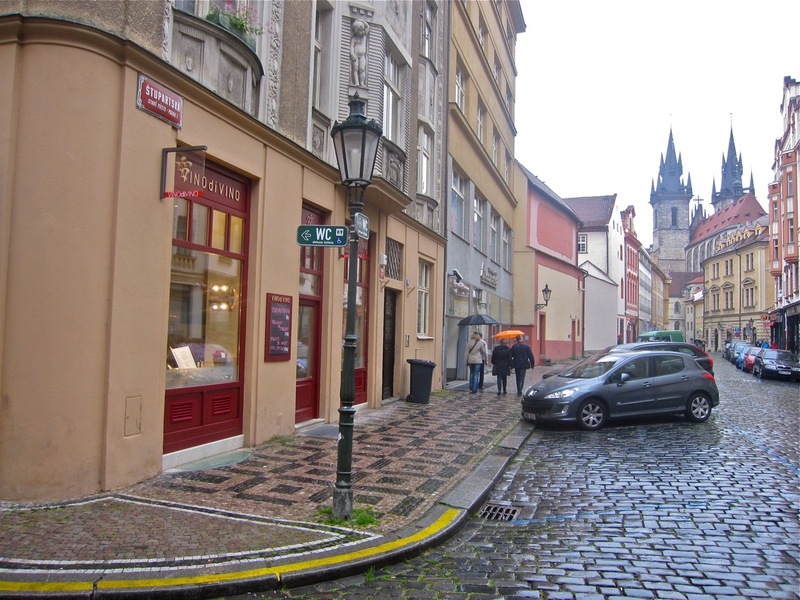 It's right in the heart of the tourist zone, not far from Old Town Square. From the front, the spires of the Týn Church are visible over the rooftops. The interior is smart and modern, with tan walls and blond woods and mixed with flashes of red. 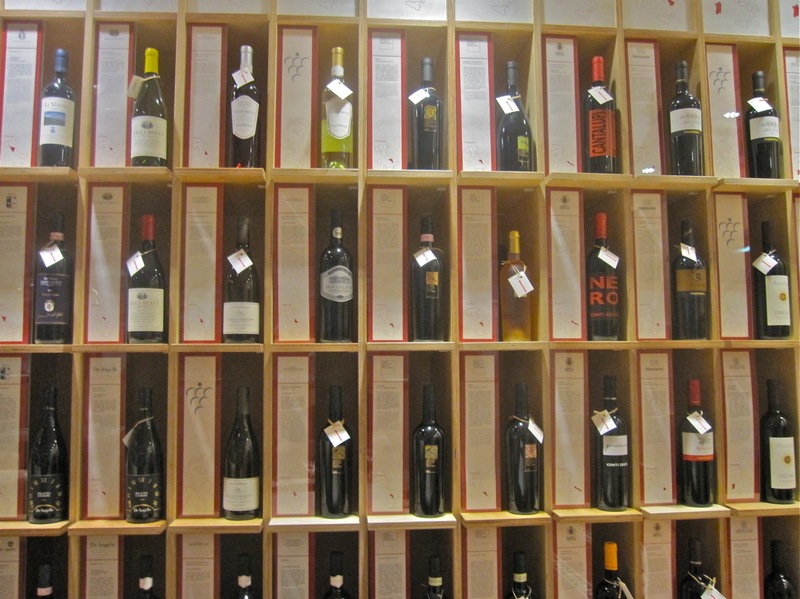 The displays of wines from all regions of Italy are built into the walls and provide an appropriate and inviting backdrop. The place is well-lit, which works well when you think of it as a shop. 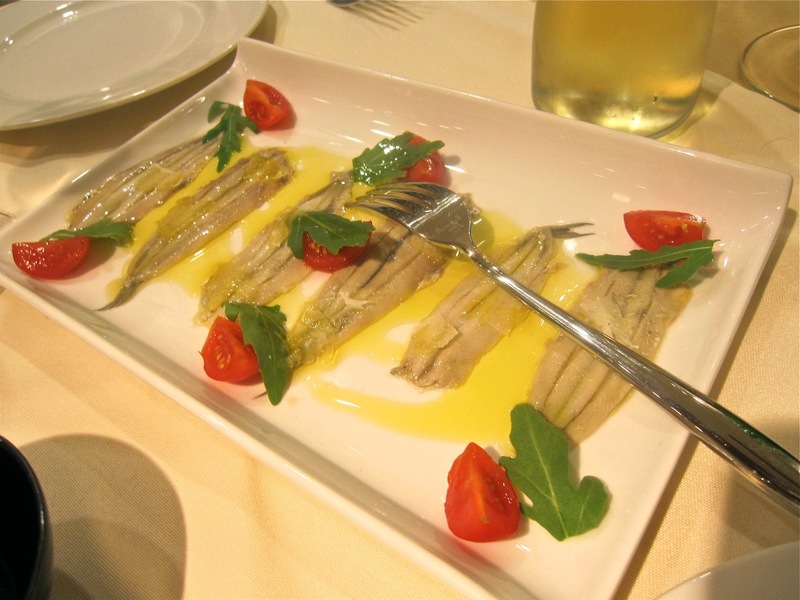 Of course, it is also a restaurant with a relatively short and not inexpensive menu. As a place for a nice dinner, it did feel too bright. We decided to go downstairs, which is part of the shop, but has more of a restaurant feel to it. My friend saw a number of good wines like some Greco di Tufo and the Falanghina from Feudi di San Gregorio. The prices of those particular wines could be quite high -- 800 CZK to 2000 CZK. These wines can cost a lot less in Italy. They also had cheaper wines in the shop. The friendly waiter brought some decent sliced Italian-style bread. It was OK, but after we went through that, a later basket was fresher. We also got some basic black and green pitted olives. We both ordered wine. I had the red, a .25 liter carafe of Sedara's Donnafugata (195 CZK). 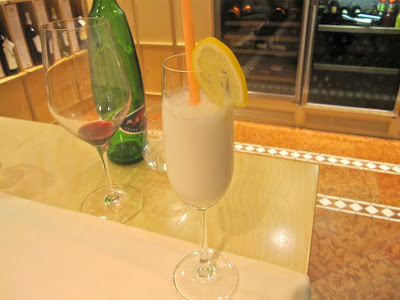 My friend had the white, a carafe of Frescobaldi Pomino Bianco (235 CZK). I can recommend both. My friend even ordered a second carafe. We also had a .75 liter bottle of Mattoni mineral water. 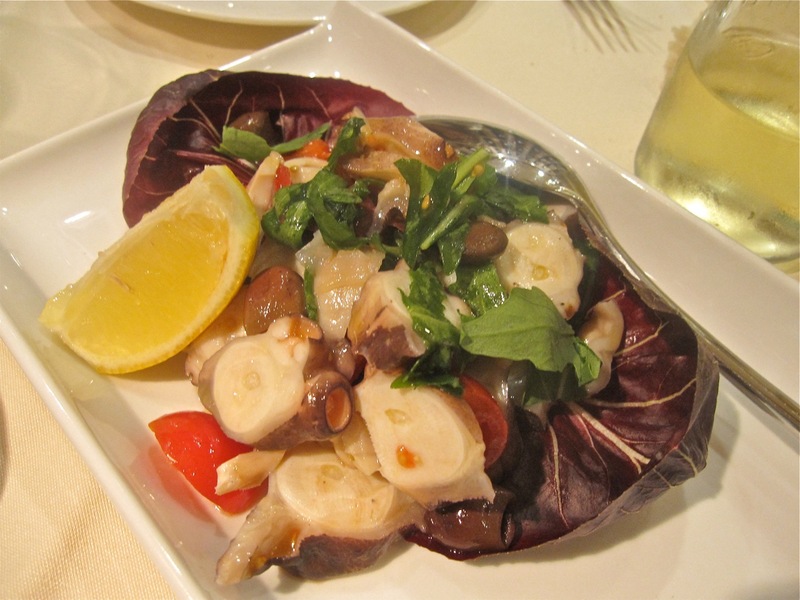 For starters, we decided to have the "Fantasie di Mare" antipasti for two (590 CZK). The anchovies in the first round were basic but nice -- lemony, with good olive oil and excellent cherry tomatoes. Next came an octopus salad. It was very fresh, very tender, and very enjoyable. 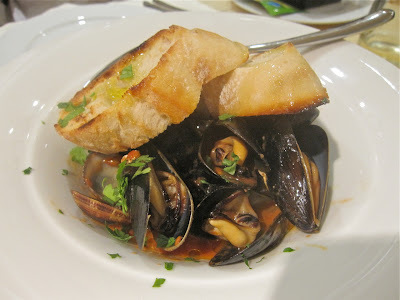 We had a small bowl of mussels and clams with parsley and a wine-infused sauce. 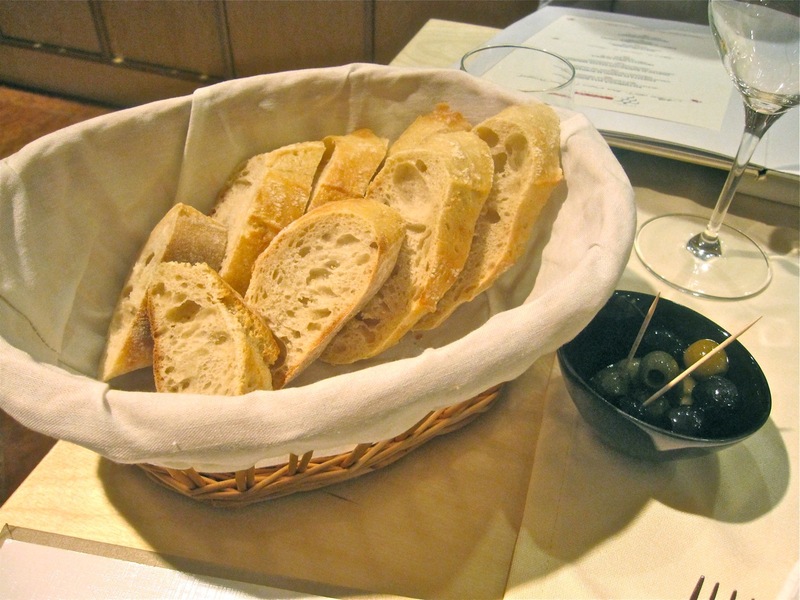 Crusts of olive oil-drizzled bread sat on top. The clams were fine and the super-fresh, plump mussels were the best I've had in a long time. The last fantasy round feature two big shrimp, expertly grilled with their heads on. 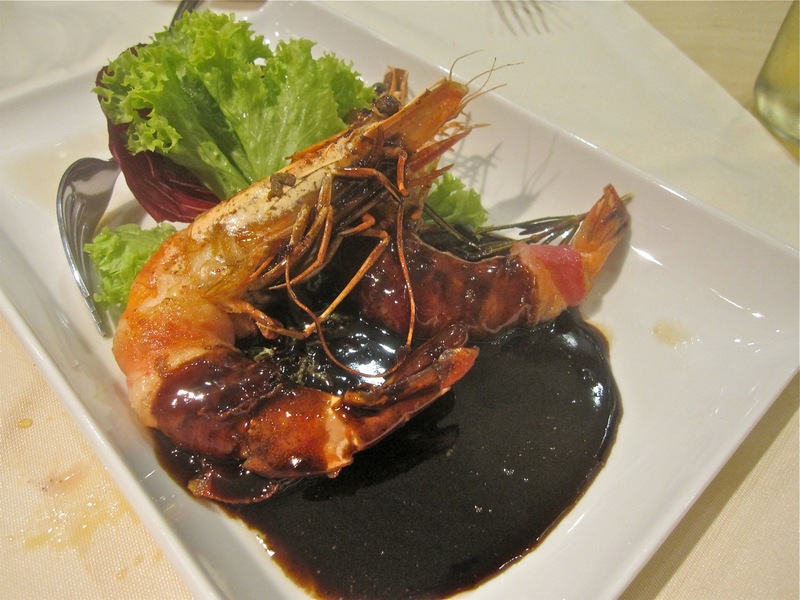 They were wrapped in pancetta and sat on a syrupy sweet sauce, which I think was a balsamic reduction. It was really good when I could get the shrimp, sauce, and pancetta in one bite, with a nice balance of salty and sweet. But the pancetta was quite small and the sauce dominated too much without it. For a main course, my friend had tagliolini al tartufo (290 CZK). 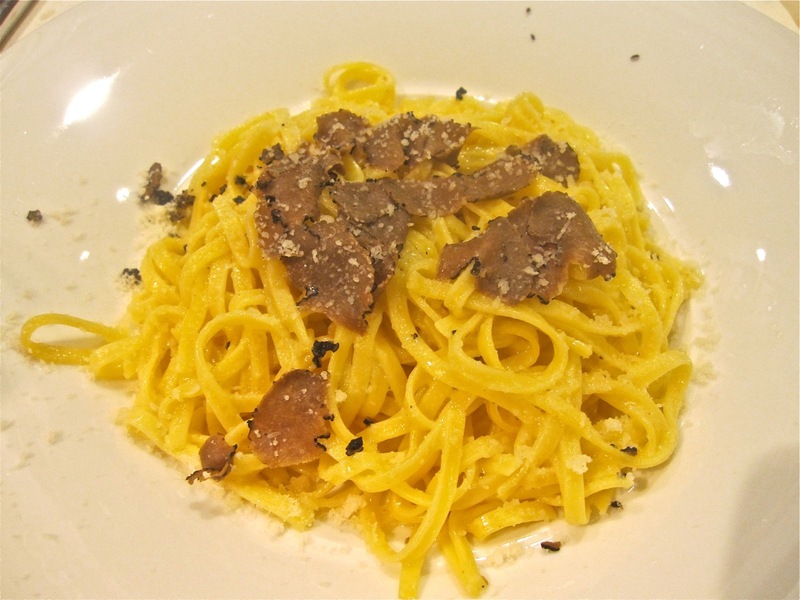 It was a simple but satisfying dish, properly cooked with a buttery coating and shaved truffle. 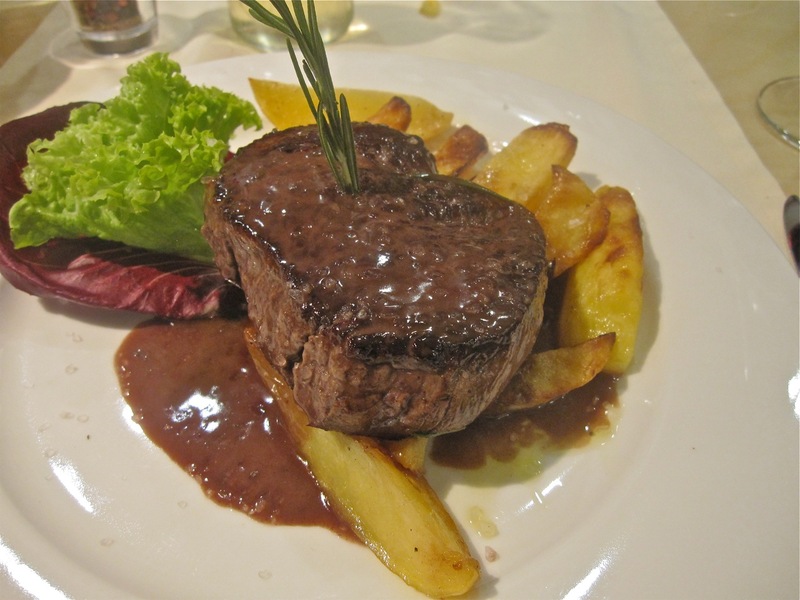 I had the beef tenderloin with Barolo sauce (420 CZK). It was cooked to order, medium rare and the meat had good flavor. The cut was firm and not very tender and on the chewy side, so there was a little disappointment. The wine lent the sauce an assertive tartness. I very much liked the potatoes seasoned with rosemary. For dessert, my friend had the lemon sorbetto (90 CZK). It was very sweet, creamy, and lemony, but not as cold as it should have been. My friend said it was not as good as others in town. On the positive side, as I write this, I see on the bill that I wasn't charged for it. The meal ended with a decent espresso (39 CZK). 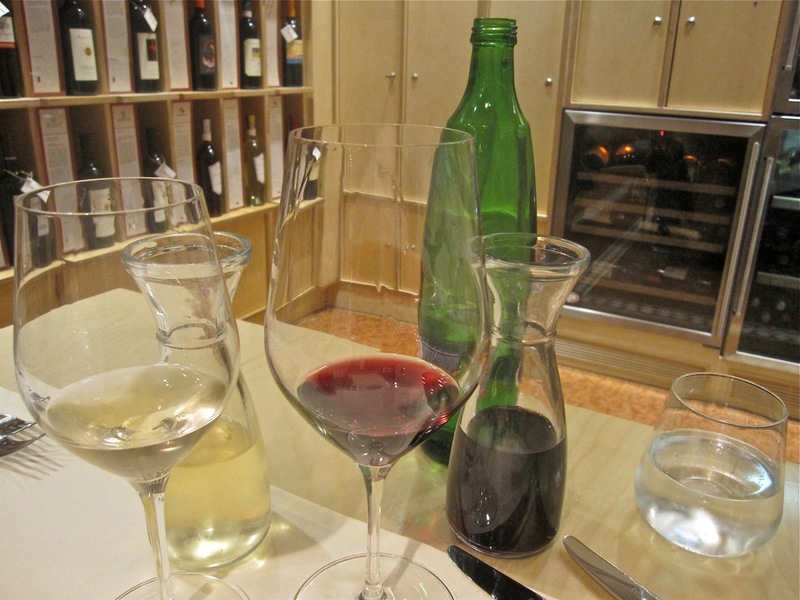 The total cost for the big dinner was 2069 CZK before tip, with 665 CZK of that spent on wine. We enjoyed our meal. 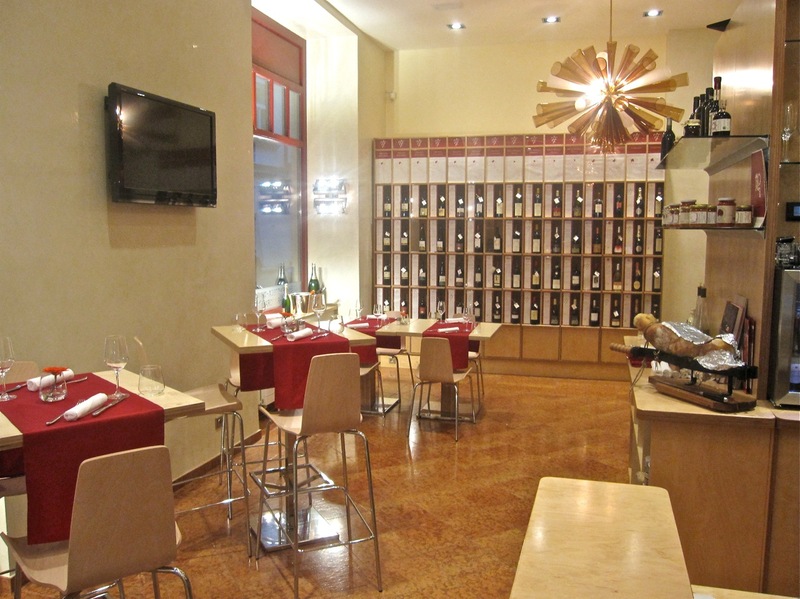 The few main courses they offer are 300-400 CZK and the pastas, some with expensive ingredients, are around 200-300 CZK. That's big money for many people, but I'd say it's worth it. 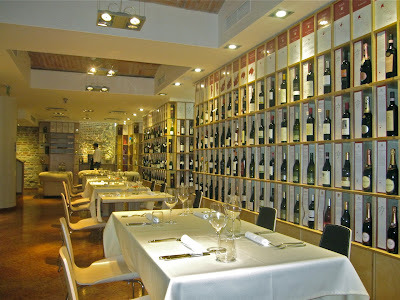 It is a shame that the website does not have the menu or give a listing of the multitude of fine wines for sale. This is a missed opportunity. I might consider buying wine there if I could review their offerings in advance. I think the restaurant is attractive, but the bright lights and the emptiness we experienced detract from the atmosphere. But those issues are easily fixed. All they needed is a dimmer and a few more people to try the fine wines and speak their minds. Hi, your post is very interesting. How was your Feudi di San Gregorio’s wines tasting? Please let us know on our fan page “I Vini dei Feudi di San Gregorio”!